Here’s how LCFF works. The short version. How is LCFF funding calculated? Which student characteristics count in LCFF? What is LCFF supplemental funding? What is the LCFF concentration factor? Is LCFF fair? Is it equitable? Are Special Education funds part of LCFF? Which education funds are not part of LCFF in California? Prior to 2013, California had an almost impossibly complex system for allocating funds to school districts. Developed without consistent principles over many years, it was loaded with inconsistencies and special arrangements. That system was erased when California lawmakers created the Local Control Funding Formula (LCFF), a much simpler and fairer set of rules. All districts receive a “base grant” for each student. The base grant is larger for grades 9-12 than for other grade levels. Base funding per student under the Local Control Funding Formula. Click image for detail. Districts receive 20% additional “Supplemental Funding” per student for students with higher needs — children Learning English, in poverty, and/or in foster care. The end result is that districts receive very different levels of funding based on how many English language learners, children in poverty and children in foster care they have. In the old system, funds were apportioned with strong restrictions on how they could be used. Under LCFF, those restrictions are gone: the use of funds is substantially left to school districts, subject to the intent of the LCFF law. This was a big change. Now it is school districts that hold the gold, and make the rules. Now it is school districts that hold the gold, and make the rules. There can be a big difference between intent and reality. Are districts actually following through on the intent of LCFF by investing more money in higher-need students? It's hard to know. The districts hold the gold, make the rules, and conduct their own accounting. The Local Control Accountability Plan (LCAP) is intended to provide information about the actual use of LCFF funds, but the accounting detail in the LCAP is minimal. In practice, it is up to community leaders to enforce the intent of the law. Nonprofit law firms and advocacy groups like Public Advocates and the ACLU have begun playing this critical role, bringing cases against districts that use LCFF targeted funds in untargeted ways. These cases are difficult. Standard public reports don't necessarily show where school district money is spent. Organizations have had to use Freedom of Information Act requests and the threat of litigation to obtain the detailed information required. In 2017 Los Angeles Unified settled such a case (Community Coalition v. LAUSD) for $150 million. All LCFF funds are technically “unrestricted,” which means school districts have discretion over how they are used. However, as explained in Lesson 7.8, there are also new accountability rules that apply. An important element of the Local Control Funding Formula is that school districts must engage parents and community to create a Local Control and Accountability Plan (LCAP). See Lesson 7.10 and What's an LCAP? for more information on how spending decisions are made. The transition to the LCFF system was unexpectedly rapid. Originally forecast to take seven years, the job was essentially done in three due to strong growth in California's tax receipts. http://fairshare4kids.org/ is a good site to see if your district is among the rare exceptions. EdSource also keeps a list of Basic Aid districts. The first step in filling a district's LCFF bucket is to pour in all the local property taxes. If those taxes fill the bucket halfway, state money is used to fill the other half of the bucket. If property taxes fill the bucket two-thirds of the way, state money fills the other third. In perhaps as many as 100 school districts in California, the property taxes will fill or overflow the LCFF Funding Bucket. In those cases, the districts keep all their property taxes and get no LCFF money from the state. These are known as “Basic Aid” or “Excess Tax” districts. There are several programs outside of LCFF for which a given district or charter school might be eligible. Together they represent more than 10% of the state funds that go to K-12 education. These funds come with strings attached. If a district does not run a particular program or have eligible students, it generally won’t receive the funds. The largest of these programs is Special Education, which has its own set of allocation rules and also requires the district to spend funds from its base allocation (see Lesson 8.6). Other programs include the Quality Education Improvement Act, the state’s after school program, home-to-school transportation, and child nutrition (e.g. school lunches). Lottery funds of about $150 per student are also outside of the LCFF funding formula, but they are uniformly distributed. In any given year the state may also provide some one-time monies for specific purposes. A few districts continue to receive small amounts of funding through state grant programs, but these exceptions are small. In addition, the federal government largely delegates to the state department of education the task of disbursing federal funding. Most of those funds are for specific programs as largely explained in Lesson 7.2. In 2018 a major research project known as Getting Down to Facts II (GDTFII) examined a big, important question: How is LCFF working? The short answer is encouraging. 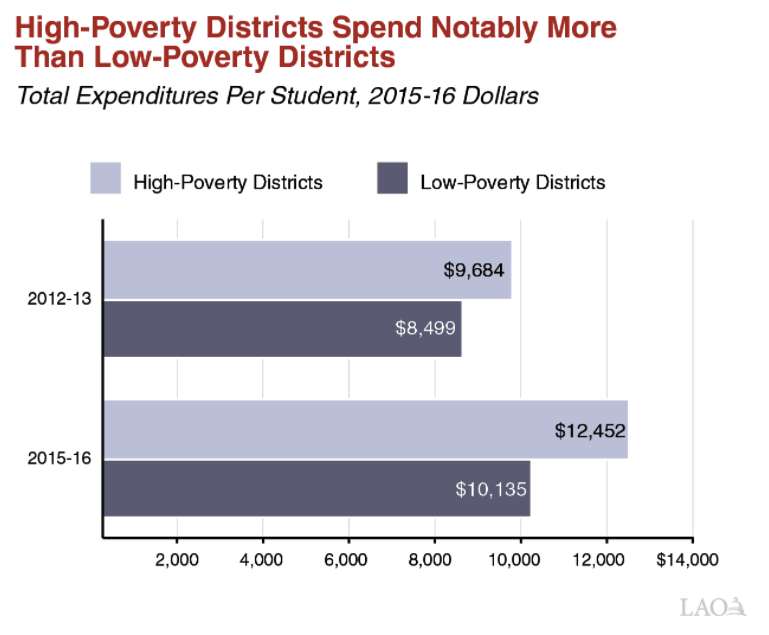 According to the researchers, "The data provide initial evidence that money targeted to districts with the greatest student needs has led to improvements in student outcomes." We find that LCFF-induced increases in school spending led to significant increases in high school graduation rates and academic achievement, particularly among poor and minority students. A $1,000 increase in district per-pupil spending experienced in grades 10-12 leads to a 5.9 percentage-point increase in high school graduation rates on average among all children, with similar effects by race and poverty. On average among poor children, a $1,000 increase in district per-pupil spending experienced in 8th through 11th grades leads to a 0.19 standard deviation increase in math test scores, and a 0.08 standard-deviation increase in reading test scores in 11th grade. These improvements in high school academic achievement closely track the timing of LCFF implementation, school-age years of exposure and the amount of district specific LCFF-induced spending increase. In sum, the evidence suggests that money targeted to students’ needs can make a significant difference in student outcomes and can narrow achievement gaps. The studies suggest considerable support for the funding formula's basic design, which directs more funding to districts where needs are greater. For example, one study for the GDTFII project surveyed Chief Business Officers, who oversee the deployment of funds in school districts. These officers generally expressed support and confidence for the changes brought about by LCFF, even in districts that did not get additional funds from the policy. Of course there is still plenty of room for improvement, according to the research. In particular, the report finds weakness in the central idea of local control through the reporting and public discussion system known as the Local Control Accountability Plan (LCAP). We examine the LCAP in Lesson 7.10. Updated August, 2017 with new LCFF budget data. Updated April, 2017 and September, 2017 to include litigation to enforce equity in use of LCFF funds. Updated April, 2018 to reflect budget changes. Updated Nov, 2018 to incorporate GDTFII research. Which ONE of the following statements about the Local Control Funding Formula (LCFF) is TRUE? LCFF funds may be used only for "core" educational purposes. LCFF funds are "unrestricted" and may be used for any purpose. Under LCFF, districts receive the same amount of funding for each student. LCFF made the school finance system more complex. Your description of property tax funding omits a key element. Yes, property owners pay taxes allocated directly to their local districts. In addition, however, a portion of EVERY tax bill is allocated to that county's Educational Revenue Augmentation Fund (ERAF). That fund is ONLY available to support LCFF-funded districts within that county and only to the extent of the State's top-up liability. Thus, an LCFF-funded school district receives (first) revenue directly allocated to it out of its local residents' property tax payments, (second) revenue indirectly allocated to it out of its county residents' property tax payments (up to, but not beyond, the State's school funding commitment to that school), and (finally) State top-up funding, if required, up to the commitment. I think here the question is confusing. The funding is " unrestricted" but funds ca not be used for just "any purpose." Parents and boards decide uses which schools are legally held accountable for at the state level. The funding is more complex , overall, because it works on a 1/2 or 2/3 city tax base as well as state matched funds. So, neither answer is optima. Unrestricted should be exchanged for a word like "unaccountable" is funds are unethically or negligently distributed among schools. This was exactly the case with Community Coalition vs LAUSD in which a community won 150 million. I recently saw that our school site budget this year is about $1.5 million and our school has about 252 students (K-5). That is less than $6k per student per year. Our school does not qualify for any supplemental or concentration funds. However, it still seems low. Am I missing something, or am I comparing apples to oranges? Funds are allocated to school districts, not to schools, and school districts have a lot of freedom about how to account for the use of funds by site. Most of the money actually spent at a school is in the form of salaries and benefits, and the actual cost of salaries can vary depending on where the specific teachers land on the salary schedule. The bottom line is that there is no single, dependable answer to your question; you need to ask your school district... and they may have trouble giving you a really clear answer. Are the costs of staff allocated based on actual expenses, or on average expenses per teacher, for example? A clarification with regard to item #2 above, "Districts receive 20% additional “Supplemental Funding” per student for students with higher needs -- children Learning English, in poverty, and/or in foster care.". Supplemental funding per LCFF uses an "unduplicated" pupil count. Thus, for the purposes of funding, a pupil may be counted in only one category. That is a helpful clarification--thanks! Yes. The system counts a student as having additional needs under LCFF if he or she is in the lunch program and/or foster care and/or learning English. The formula is meant to create an "unduplicated" count of these students. In a nasty twist of jargon, a student that falls in any of these categories is now known as an "unduplicated" student in educationese. For example: "Our school has 27 unduplicated students." "We provide well for our unduplicated students." "Jose and Maria are unduplicated students." I think it's important for parents in our district to understand how money flows to the district, but because of the size of the state, we have limited influence on that. It may be more important for parents to understand how money flows to schools WITHIN the district. Some schools don't have enough to meet basic needs, while others have more. Sherry - it's absolutely true that parents ought to understand how districts allocate money to their schools. Since those decisions vary a lot from one school district to another, we'd encourage parents to directly ask school officials that very important question. You might want to start with your school principal, but if you don't learn what you want to know or that raises additional questions, my next stop would be the superintendent's office. Your locally elected school board members should also be helpful. Some districts make school budget decisions very transparent and others do not. In my view, all should be happy to answer these kinds of parent questions.